It’s fox season ! 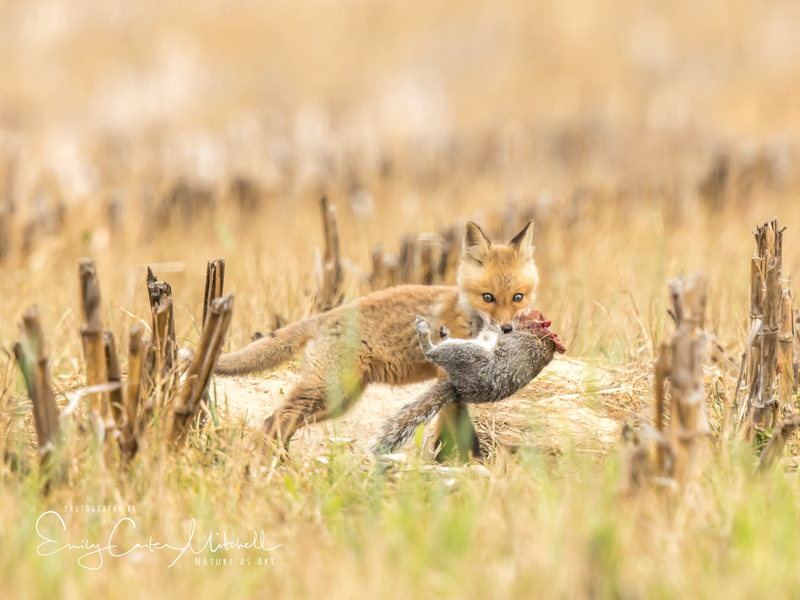 Actually all the time is fox season for me, but in particular this is the time of year that all area nature photographers are out on a fox hunt. 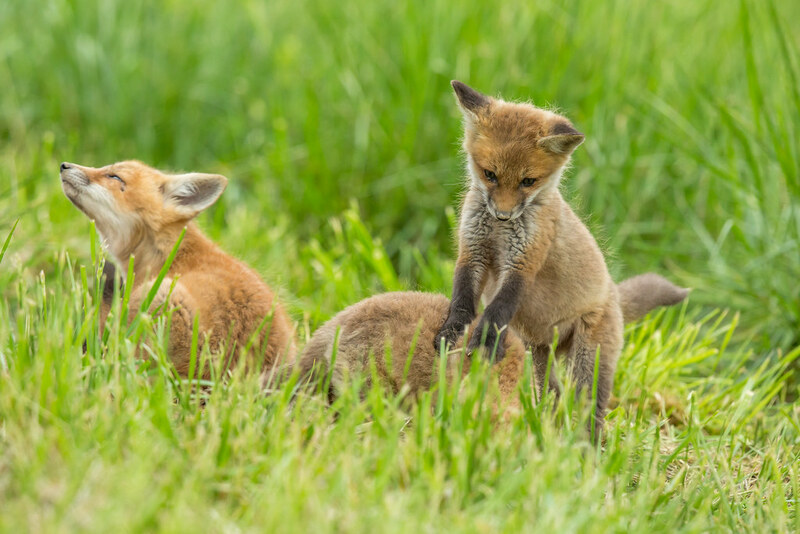 Really what we’re looking for are darling little fox kits like the ones we get to enjoy at Bombay Hook National Wildlife Refuge in Smyrna, Delaware. 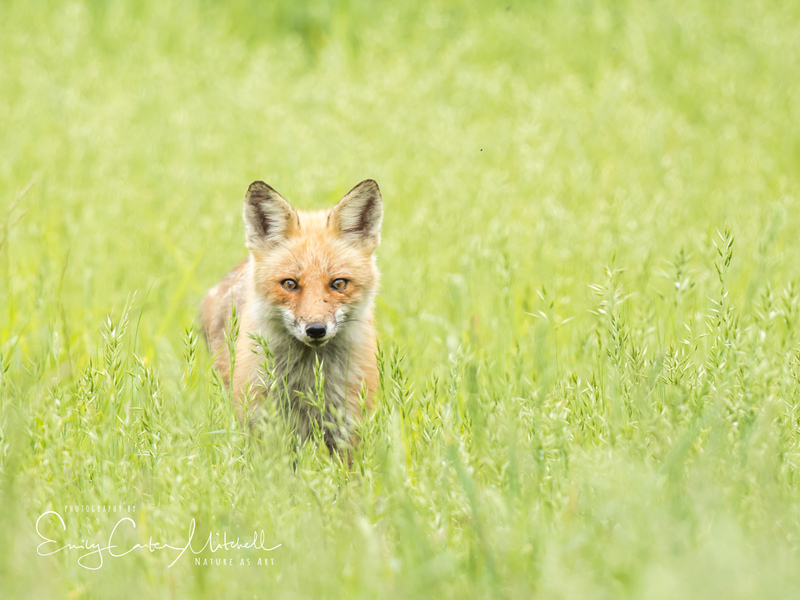 Like the ones in 2015 or even better the fox den right along the wildlife loop road in 2016. I have found foxes everywhere, including at the manor although he only shows up at night. The only sights of foxy I get are with my handy dandy trail cam. Keeping my eyes opened everywhere I go, I hope that one day I’ll come across a fox den and enjoy kits for another season. Then when I least expect it when I’m driving down a quiet country road, movement in an old corn field catches my eye and what do I see? A fox with her kit. With her keen eye, she immediately saw me watching her and she trotted off. It didn’t seem that she was concerned but rather on a mission. Perhaps hunting for her little one. I waited a bit, and then noticed that there were two kits. But wait…mom left them something for breakfast ! The larger one grabbed what looked like a rabbit and ran off with it. Leaving his sibling wishing he would come back. I watched and waited a little longer wondering what would happen. Then up pops up another kit. 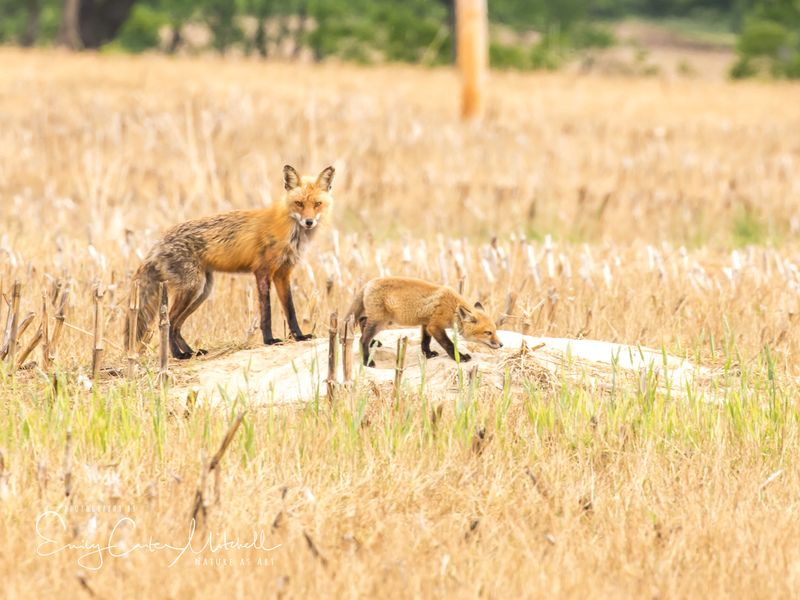 A successful season for this Momma fox with her three little ones, but she’ll be busy keeping them fed. My day was growing short and it was time to leave. I also make it a point not to overstay my welcome with wildlife. There is always another day. Coming home, it poured rain all night and kept on in the morning. To me during this time of year this means that Foxy comes out to play during the day. Sure enough! Found another fox today. It sure has been a foxy week. Who knows what next week will bring. 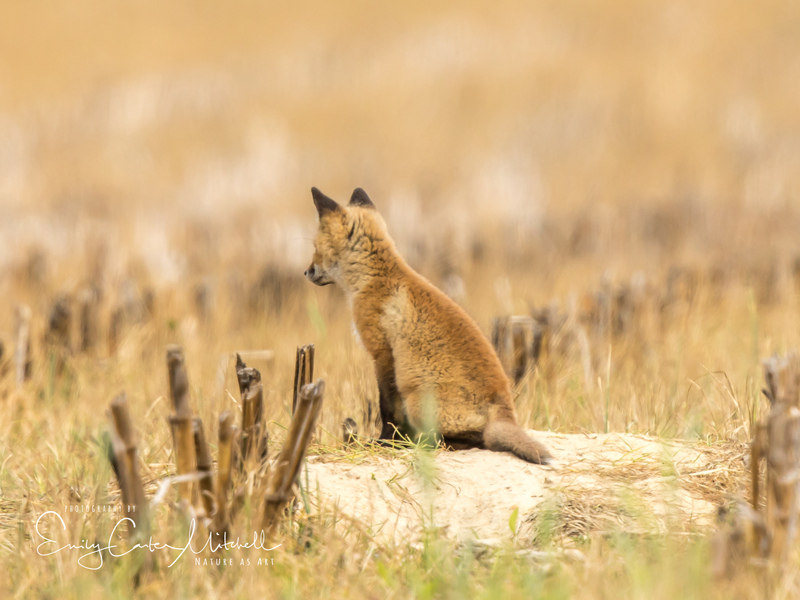 Great series of foxy images! Really like the variety of activities and settings. Well done. I’m always searching for kits at just the right age as in your images – but have yet to be in the right place at the right time. I visited a den recently, only to discover two kits with mange, one that appeared to be serious. Hi Nick! Thanks for your great comment. You can actually help the fox kit if you want as mange is treatable. Using Ivermectin for cattle which can be found on Amazon. Here is a great post to follow for treatment. Good luck ! My pleasure. It really has been a fox-filled week. Saw more yesterday. Awesome work! I can’t wait for your next post. You are too kind Phyllis. Hopefully the next one doesn’t disappoint. Thank you so much for your kind comment Raoul. Truly appreciate your kindness. Thank you so very much Pete. Thrilled you enjoyed these so. How very special! You’re so lucky to witness such things! I am truly blessed to enjoy God’s creatures so Fatima. It is my journey to share these discoveries with you. Hugs !! I love the pictures! I am too a fox person and seeing a fox for the first time was amazing to me. I love to see other people like you enjoying the wildlife and the world around them.